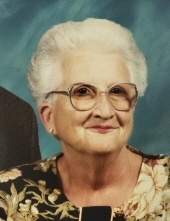 OSBORNE, Ruth E., 87 of South Charleston, joined her beloved husband in Heaven on Thursday, January 24, 2019. She was born on November 26, 1931, in Hamilton County, Ohio the daughter of the late Leonard and Okie (Mabry) Dalton. Ruth is survived by her son, David Osborne; daughter and son-in-law, Betty and Chuck McNier; grandson, Charlie (Tanya) McNier; grandson-in-law, Stephen Wertz; great-grandchildren, Gabrielle, Harlee and Kelson; brother, Curt (Peg) Dalton; sisters-in-law, Mary Lou (Ron) Williams and Norma Osborne; granddaughter, Anne; and numerous nieces and nephews. She is preceded in death by her husband, John Osborne; son, Roger Dale Osborne; brothers, Kenneth, Harold and Shelby Dalton; sister, Ruby Dunn; and nieces, Dianna, Elaina, Linda Faye, Amy and Lou Ann. Ruth was a 1950 graduate from South Charleston High School and retired from Shoemakers Grocery after several years. Viewing will be held on Sunday, January 27, 2019 from 2-4p.m. at INGLING WILLIAMS & LEWIS FUNERAL HOME-South Charleston, where service will be held on Monday, January 28, 2019 at 10:30a.m. Burial will follow at Greenlawn Cemetery. Condolences may be expressed to her family by visiting www.jacksonlytle.com. To send flowers or a remembrance gift to the family of Ruth E. Osborne, please visit our Tribute Store. "Email Address" would like to share the life celebration of Ruth E. Osborne. Click on the "link" to go to share a favorite memory or leave a condolence message for the family.